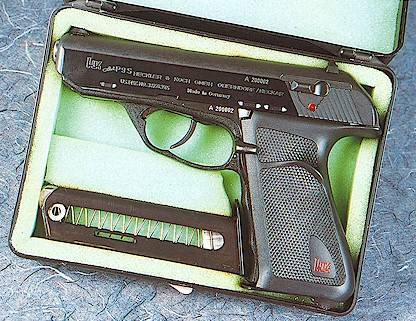 P9S semiauto combat handgun (the S on the name means Spannabzug, "Double Action Trigger"). This weapon was made in many models: 9x19mm-Parabellum (the same 9x19 model was many times converted in 9x21mm-IMI and 32-ACP for the italian civilian shooters community) and .45-ACP (for military; this version was in use by many Navy elite teams, such as USA SEALS but also German and Japan). This gun is VERY reliable and accurate also when suppressed. A special long-barreled version for suppressed use of this weapon is called "Hush-Puppy".